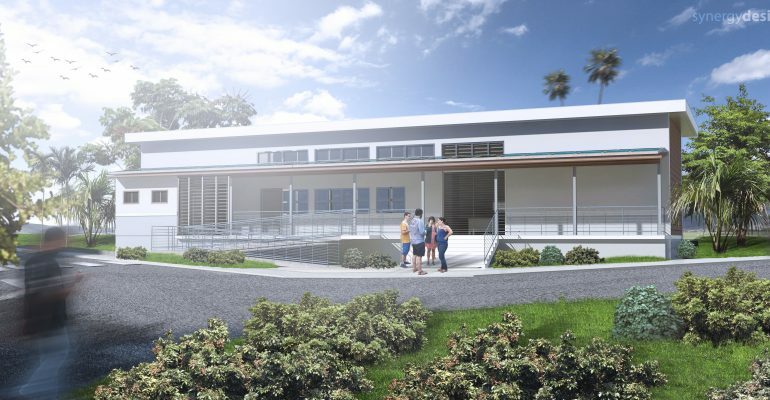 The image above shows the final rendering for the Net Zero Energy Building (NZEB) being constructed at The University of the West Indies (UWI), Mona under the Low Greenhouse Gas Emissions: Promoting Energy Efficiency & Renewable Energy Building in Jamaica (LGGE) Project. 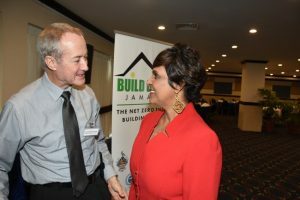 The building, which is nearing completion, will be a prototype for NZEB in Jamaica and the region. The building features energy efficient architecture, rectangular in shape with the shorter ends facing the morning sun in the east and the setting sun in the west, this orientation ensures that only a small wall surface area is heated by direct sunlight. The core of the building is the only area that is mechanically cooled and the habitat for persons who use the building. The eastern and western faces are protected by non-inhabited spaces such as store rooms, restrooms, electrical and mechanical closets. The southern face of the building is shaded from direct sunlight via a veranda of covered walk-way. The northern face is left exposed with large windows to maximize secondary sunlight penetration. On both the north and south walls, glass windows are also mounted up high to allow maximum secondary light penetration to reduce the need for artificial lighting during day time work hours. A slab roof was used as the more cost effective roofing solution. Preliminary analysis shows that if more than 90% of the roof slab is covered with solar panels then no insulating material is required provided the roof membrane is white to reflect sunlight. Energy efficient LED lighting and variable speed compressor multi-split air condition units are used to maintain low energy demand. High ceilings will ensure the thermal comfort of the occupants along with sun shades to reduce or eliminate the need for mechanical cooling. N.B. Before selecting air conditioning equipment, a designer should evaluate along with the client, the use of passive cooling technology. 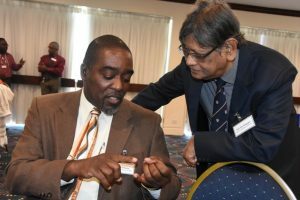 A workshop presenting guidelines for Net Zero Energy Building & Retrofitting of existing buildings was hosted on June 6, 2017, by the Low Greenhouse Gas Emissions: Promoting Energy Efficiency & Renewable Energy Building in Jamaica (LGGE) Project. 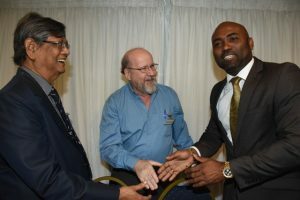 The event held at the Jamaica Pegasus Hotel and titled “National Building Policy Workshop: Presenting Guidelines for NZEB & Retrofitting”, was the second in a series under the project being implemented by the Institute for Sustainable Development (ISD) of the University of the West Indies (UWI) with financial support of the Global Environment Facility (GEF) and technical assistance of the United Nations Environment Programme (UNEP). The project is poised to deliver Jamaica’s and the Caribbean’s first Net Zero Energy Building (NZEB) – a demonstration of emerging and best practices in the built environment. The project also includes the retrofitting of the National Housing Trust (NHT) building in Kingston to improve the energy and environment performance. The June 6th workshop advanced the LGGE’s work in developing policies and practices as well as regulatory and technical tools that will mainstream the lessons and transform the opportunities for promoting energy efficient buildings. Paul Hay presented on “Energy Efficiency in the Building Code”, Keroma Bernard, Policy Consultant for the LGGE project presented the draft “National Building Policy Guidelines for NZEB Construction & Retrofitting in Jamaica” and Dr. Earl Bailey, Lecturer in the Built Environment, University of Technology “Hazard Vulnerability Analysis for Jamaica’s Built Environment”. Principal Investigators of the project, Professors Tara Dasgupta and Anthony Clayton updated participants on the project and the energy sector, respectively. The workshop which was chaired by Project Manager, Kevin Rodriguez, was attended by a range of stakeholders including environmentalists, architects, engineers and construction industry professionals and public sector policymakers, allowed them “a voice” in recommendations for NZEB building policy regulations to be presented to government. 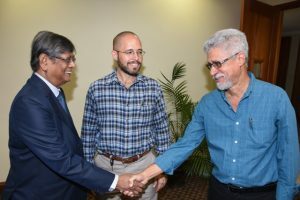 Principal Investigators of the Low Greenhouse Gas Emissions: Promoting Energy Efficiency & Renewable Energy Building in Jamaica (LGGE) Project, Professors Tara Dasgupta (left) and Anthony Clayton, in conversation with Hon. 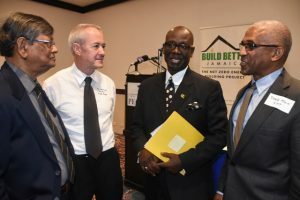 Desmond McKenzie (3rd left), Minister of Local Government & Community Development and Donald Moore, Senior General Manager, National Housing Trust prior to the start of the project’s National Building Policy Workshop at the Jamaica Pegasus on June 6, 2017. 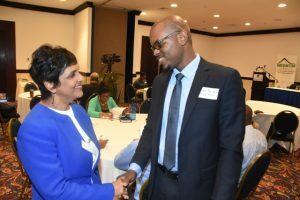 Dr. Ruth Potopsingh, AVP Sustainable Energy Department, University of Technology with Keroma Bernard, Policy Consultant on the Low Greenhouse Gas Emissions: Promoting Energy Efficiency & Renewable Energy Building in Jamaica (LGGE) Project, at the start of the project’s National Building Policy Workshop at the Jamaica Pegasus on June 6, 2017. 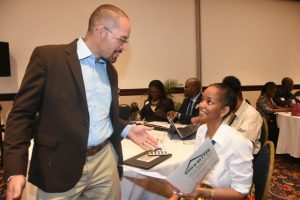 Kevin Rodriguez, Project Manager of the Low Greenhouse Gas Emissions: Promoting Energy Efficiency & Renewable Energy Building in Jamaica (LGGE) Project, in discussion with Heather Pinnock, Project Manager of “Renewable Energy & Energy Efficiency in the Public Sector” project, at the start of the project’s National Building Policy Workshop at the Jamaica Pegasus on June 6, 2017. 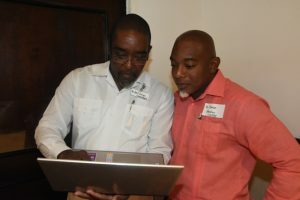 Dr. Earl Bailey (left), Lecturer in the Built Environment, University of Technology and Dr. Devon Gardner, Programme Manager, Energy, at Caribbean Community Secretariat compare notes at the Low Greenhouse Gas Emissions: Promoting Energy Efficiency & Renewable Energy Building in Jamaica (LGGE) Project’s National Building Policy Workshop at the Jamaica Pegasus on June 6, 2017. 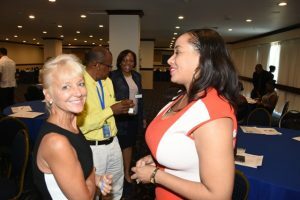 The Energy Policy Workshop was held on March 23, 2017 at the Jamaica Pegasus Hotel. Here are some highlights. Prof. Tara Dasguta, Principal Investigator, LGGE Project; Kevin Rodriguez, Project Coordinator, LGGE Project and Christopher Shaw, Lead Consultant, APEC Consultants Ltd. The Low Greenhouse Gas Emissions: Promoting Energy Efficiency & Renewable Energy Building in Jamaica (LGGE) Project boasts a highly qualified team which is delivering Jamaica’s and the Caribbean’s first Net Zero Energy Building (NZEB). Louise Fletcher is the Mechanical/Electrical Engineer on the NZEB Team. She is Founder & Managing Director of an engineering consultancy firm – Planning & Fletcher Limited which specializes in design, supervision and installation of mechanical and electrical building services. 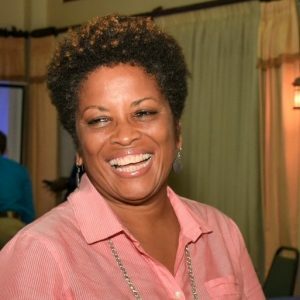 A LEED certified Engineer, Ms. Fletcher has participated in workshops hosted by the US Green Building Council, UWI and others and is a member of the Jamaica Institution of Engineers and the American Society of Heating, Retrofitting & Air Conditioning Engineers (ASHRAE). Ms. Fletcher has designed mechanical and electrical services in Jamaica and Trinidad & Tobago. Stuart Sykes is the Structural/Civil Engineer on the NZEB Project. 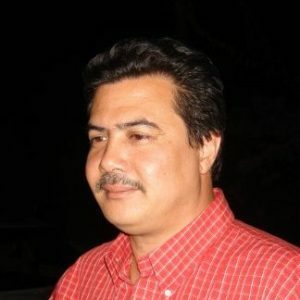 He is Proprietor of SGS Engineers which provides general structural and civil engineering services including analysis, design and drafting of building and civil structures, damage assessment and reporting and project management. 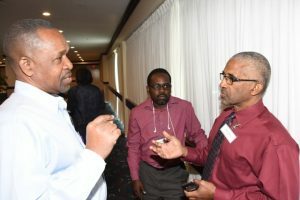 A member of the Jamaica Institution of Engineers and registered with the Professional Engineering Registration Board (Jamaica), Mr. Sykes has planned, coordinated and implemented construction and renovation for a number of major projects in Jamaica including steel and reinforced concrete buildings and bridges.